Fear of espionage led the United States government to exile thousands of Japanese American citizens to internment centers during World War II. In 1942, one of a few internment centers in the nation, the Granada Relocation Center, also known as Amache, was built on Colorado’s eastern plains. 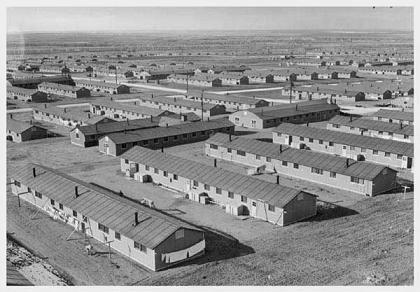 Surrounded by barbed wire and wood-framed guard towers, the center at Amache consisted of housing units, a school, a hospital, warehouses, utility buildings, and a military police compound. Over 7,000 of our fellow citizens were relocated to Amache, where they lived and worked until the center closed in 1945. Today the site retains tangible reminders of those years, including foundations of center facilities, trees planted by former internees, one of only three surviving relocation center cemeteries in the nation, and intact original dirt and gravel roads. Just two years after WWII ended, there we no more buildings standing at Amache. All remnants of habitation at the 600-acre site had been striped, sold or razed immediately following the war’s end. Most of the buildings, or pieces of deconstructed buildings, ended up in nearby counties in southeastern Colorado, Oklahoma, and Kansas. In February 2006, Amache was designated a National Historic Landmark by the National Park Service. In 2007 the Friends of Amache and the National Park Service organized a Comprehensive Interpretive Plan and Conceptual Development Plan outlining the interpretive and educational goals of the Amache site. The Plan creates a more interactive, sensory visitor experience at Amache that can be provided by the physical presence of buildings on site grounds. An additional interpretation project created podcasts/driving tours, and installed additional wayfinding signs. 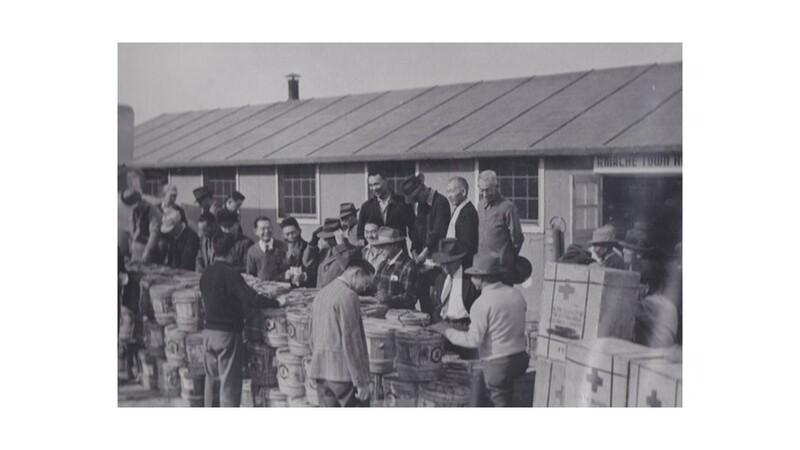 CPI is scheduled to move this next phase forward with the help of critical partners, including former internees and descendants from the Fuchigami and Taniwaki families, among many others. Remarkably, the original water tower tank was found, mostly intact, at a nearby ranch. The owners donated the tank to the Amache Preservation Society to be used for reconstruction. 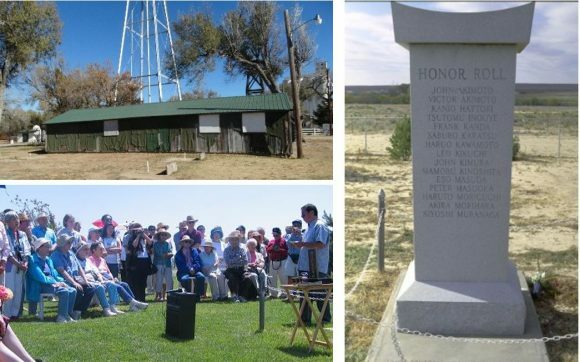 Working in partnership with the Friends of Amache and the National Trust for Historic Preservation, Colorado Preservation, Inc. was awarded two grants from the National Park Service’s Japanese American Confinement Sites Grant Program for the reconstruction of the guard tower and water tower. A 2012 National Park Service grant of $241,124 facilitated the reconstruction of the barracks building. The barracks at Amache were divided into six rooms, each housing four to seven people; the reconstruction gives visitors a visual and physical indication of the crowded conditions. Located near a reconstructed guard tower, the structure reminds visitors that Japanese Americans at Amache were under constant surveillance, although crime was virtually non-existent. A 2011 Amache building stock survey revealed that an original building from Amache, identified as “Rec.Hall 11F” was standing nearby, having served the town of Granada as a storage shed since the 1940’s. The original stenciled nomenclature “Block 11F” still visible on the siding allowed a positive ID and foundation match. John Hopper of the Amache Preservation Society worked with the City of Granada to arrange a generous donation of the building back to the site. This move is set for Spring 2018. The National Park Service’s JACS grant program provided critical funding for this move. Once the building is reset on the foundation and listed within the Landmark designation, History Colorado State Historical Funds will match these funds to mothball (close up) the building. Once secured on site, Gates Family Foundation funding will support the historically accurate reconstruction of a 20 foot section of the building removed to fit it on a flatbed truck in the 1940’s. The Friends of Amache, the Amache Preservation Society, the National Park Service, Colorado Preservation, Inc., the National Trust for Historic Preservation, and Colorado’s Congressional Delegation worked together to document and garner support for the preservation of Amache. Amache is maintained and stewarded by the Amache Preservation Society, which is directed by Granada High School Social Studies Teacher John Hopper and his students. Each year, national pilgrimages are made to all former WWII Japanese-American relocation sites. Amache is open to the public and visitors may learn about the site through an official driving tour with numbered waypoints and narrated podcasts. Click here to learn more about the history/current projects at Amache. At the 2013 Dana Crawford Award Celebration, award recipient Evan Makovsky eloquently stated how “we must never forget the internment of the innocent people” at Amache, and how we should educate ourselves and the public about this past event so it is never repeated. As a show of their support for Amache and Colorado Preservation, Inc.’s efforts to preserve it, Evan and Evi Makovsky generously pledged a match for gifts to Amache. Please consider making a tax-deductible gift to Colorado Preservation, Inc. for Amache. Your donation will be used specifically to support efforts to educate the public on the history and significance of Amache through its preservation. It’s easy: mail a check to Colorado Preservation, Inc., attn: Amache at 1420 Ogden Street, Suite 103, Denver, CO 80218. Or, you may donate online below.